Excellent location (central, close to many restaurants, shops and public transportation). Spacious comfortable apartment. Pleasant staff. The location and staff are fine. The kitchen is well equipped! Location was amazing. Stores and restaurants right next to apartment. The location is excellent, walking distance to most popular attractions. The appartments are big and comfortable, clean and fully equiped. Great location, within walking distance to most of the attractions. The apartment (actually - studio) is pretty big and furnished in IKEA style. Not bad at all! Everything is clean and ready to be used. Good location for shopping, restaurants, transportation and apartment was spacious. large room. Central Location to move around the area. Lock in a great price for Royal Route Residence – rated 8.3 by recent guests! 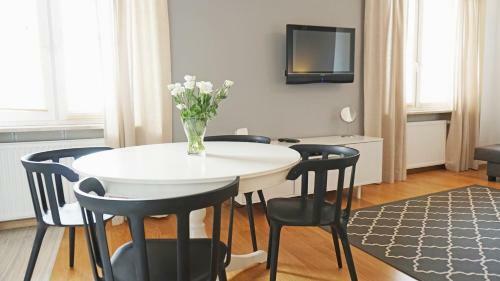 One of our top picks in Warsaw.Within walking distance of the railway station and popular attractions, Royal Route Residence offers you modern and stylish apartments in a renovated historical building on one of the most famous streets in Warsaw. This residence consists of 21 independent apartments and is a fantastic alternative to a traditional hotel. 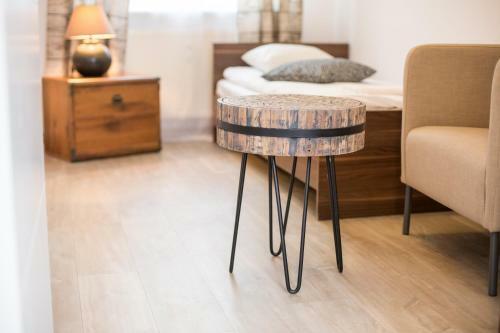 These comfortable apartments all have fully equipped kitchens and a wide range of modern amenities, including free internet access and free HBO and sport channels. Royal Route Residence is housed in a grand 18th-century building, within walking distance of the Old Town and the business district. You will also find the city’s best restaurants, nightclubs and bars in the surrounding area. 뀐 Located in the real heart of Warsaw, this property has an excellent location score of 9.3! When would you like to stay at Royal Route Residence? 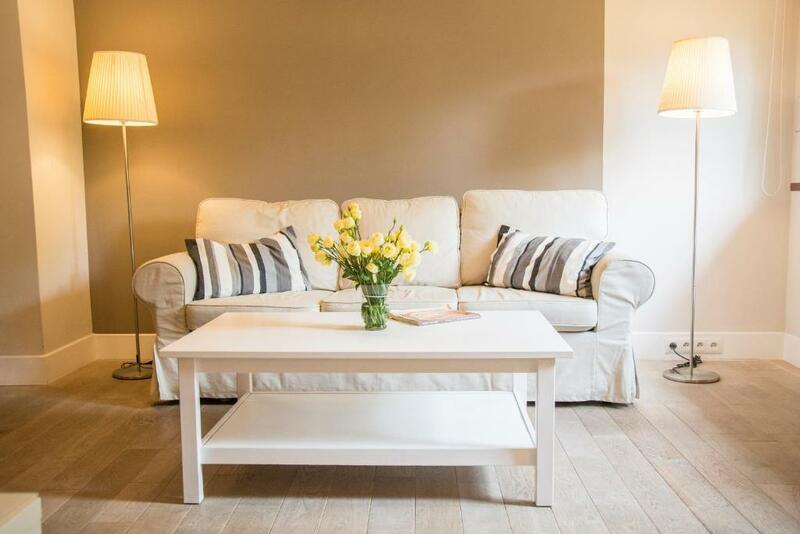 A bright and elegant apartment with a cable TV and a fully equipped kitchen. This spacious apartment offers cable TV, and its fully-equipped kitchen allows you to make your own meals. Spacious studio with a kitchen and a seating area. There is a small welcome gift for the guests. More spacious room with a nice view. There is a small welcome gift for the guests. A spacious apartment with a kitchen. It has a terrace with a view on Nowy Świat street. Please note it is located 164 feet from the Royal Route Residence building and reception. Simple studio apartment located on the second floor at 43 Nowy Świat Street and offering a view of the courtyard. There is no elevator in the building. This studio has a sofa, kitchen and washing machine. It is located on Chmielna Street, 164 feet from the Royal Route Residence main building. A 2nd floor apartment with 3 bedrooms, a living room with a kitchenette, and a dining area. It features cable TV and WiFi. This apartment includes a living room with 2 sofas, a bedroom with a double bed and a bedroom with a single bed. 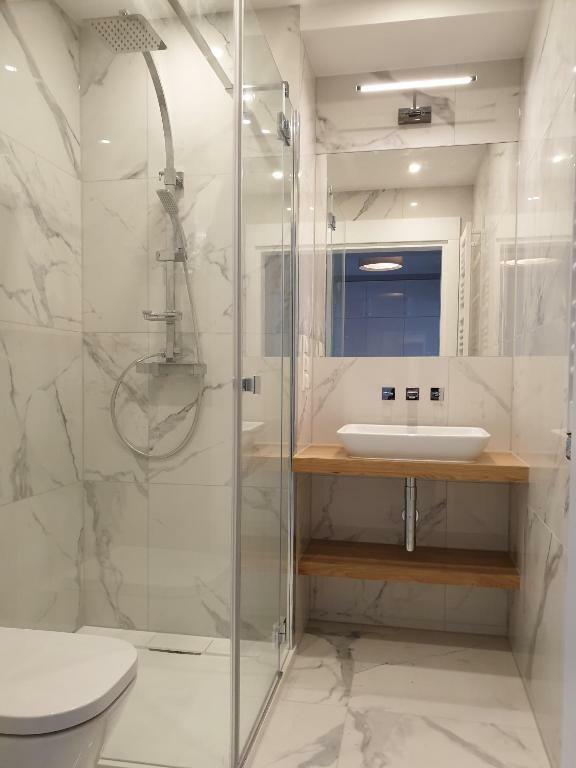 This apartment has air-conditioning, a seating area, a kitchenette, a private bathroom and a bedroom with a double bed. It is located on Nowy Świat 43 on the 3rd floor with no elevator access. This enchanting residence is one of our most cherished establishments. We've been on the accommmodation market since 2000, and Warsaw was one of our first locations in Europe. Currently, we manage apartments and hotels in many different European destinations. 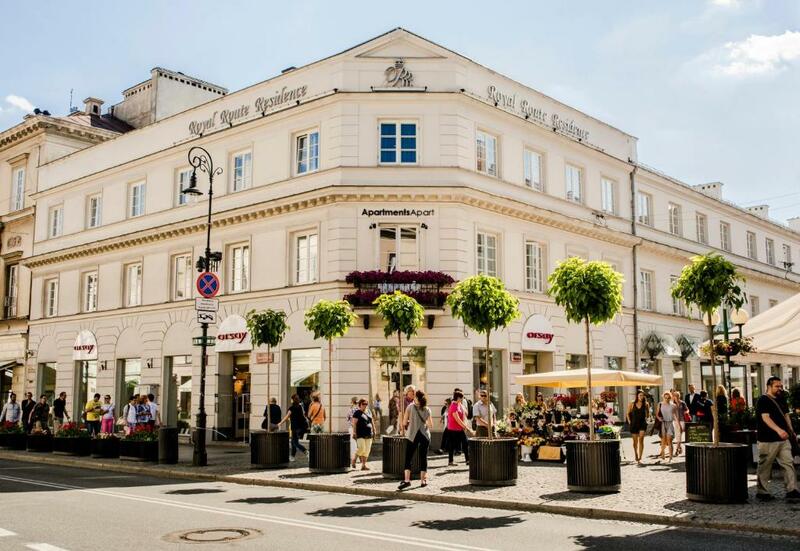 At the Royal Route Residence in Warsaw you'll also find our local reception office and staff always glad to assist you. This XVIII century block, with modern facitilies, unique design, and home amenities, will guarantee an unforgettable stay. House Rules Royal Route Residence takes special requests – add in the next step! A PLN400 damage deposit is required on arrival (around USD105.86). This deposit will be fully refunded at check-out, as long as there isn't any damage to the property. All children under 2 years are charged PLN 80 per night in a crib. Royal Route Residence accepts these cards and reserves the right to temporarily hold an amount prior to arrival. Please note that the reception is open from 09:00 to 20:00 on weekdays and from 09:00 to 17:00 on weekends. The reception is located in the courtyard, accessed through the gate at ul. Nowy Swiat 27. Should your arrival be outside these hours, please contact us at least 40 minutes prior to arrival. Arrivals after 22:00 are subject to a 15 EUR late check-in fee. The apartments are located on the 1st and 2nd floor without a elevator. Breakfasts are served from 08:00 at a restaurant located within a 2-minute walk from the apartments and can be delivered to the apartment. Please note that Royal Route Residence does not serve breakfast on Saturdays and Sundays. Please inform Royal Route Residence of your expected arrival time in advance. You can use the Special Requests box when booking, or contact the property directly using the contact details in your confirmation. A damage deposit of PLN 400 is required on arrival. That's about 105.86USD. This will be collected by credit card. You should be reimbursed on check-out. Your deposit will be refunded in full by credit card, subject to an inspection of the property. - we came to the place where the apartment should be, but the reception was around the corner, so the sign of the reception should be more visible, - there are only stairs to the reception without elevator, so you better leave your big luggage downstairs, - the main light in the hall of the apartment was not working, also the light in the bathroom was malfunctioning, overall the apartment was "very used", - WiFi was very poor, - handles on water taps on the sinks and the shower were adjustable very poorly - hardly up and down, so the water was either running on low flow or then, when we tried to add up a little bit of water it started to splash everywhere, - only 2 towels for each person, no hand towel in the bathroom or bathroom pad, - the guys living next to us were pretty loud and we shared 1 wall through which we could here them like they were in our apartment, - if you expect to get a good sleep you probably won't - from one side there's a main street full of clubs, under the apartment on the 1. floor there's a club with loud music and in the inner block there are also clubs playing loud music. - the kitchen was equipped very well, - the apartment was clean, - there's a rooftop you can access through the window and you have a great place to relax or enjoy the club music from club's around, - the staff was really nice and helpful. The apartment was more than amazing. It was clean and cozy, what’s more important - it was just like in the pictures on Booking. The check in was very quick, we received 2 keys and an instruction of how to use WiFi and how to check out + the room rules. Be ready that you will be asked to give your credit card number as in case you break or damage something in the room, you might be charged. The location of the apartment was in a 15-20 minute walk from the Old town and half an hour walk to the river, so we didn’t spend money on transport at all. The kitchen’s fully equipped, bedrooms and the bathroom are clean, there are enough towels for everyone. As this was a separate apartment we could come and go whenever we wished without waking anybody up. We would come back here again. Totally recommend. The apartment was incredible value for money. It was spotless ,comfy and had everything you needed. Great location, nice apartment and great value for money. Highly recommended. The apartment has all you need, it is clean and lovely. You can cook something, or enjoy tasty local food just around the corner. Staff is helpful and quickly reacts to requests. Totally recommended! Old facilities, but the apartment was cozy. Perfect location on the main street. Room wasn't uber clean when I got there and a bit dated, but good enough I guess. Area had lots of kinda undesirable people, taking smoke breaks right next to the entrances and homeless guys there too. But, I know they are renovating the place and hopefully the back area won't be the main entrance forever. Construction still going on. Location was excellent. Transport links nearby. Room was simple but nice enough. Worked perfect for me. Staff was EXCELLENT. I didn't interact much, but very professional. Kitchen worked out well, good for breakfast and helped that corner stores were nearby. Area was quiet too. The room was a bit dirty. Fortunately I found some products and I cleaned it myself. It is placed in the middle of everything. Half way to the new city center.. Half way to the old Town. Without an elevator, might be a problem for older people. Nothing else than that.